William Marshal rose from obscurity to become one of the greatest knights in European history. He served four kings and had even been named regent of the last of the four. 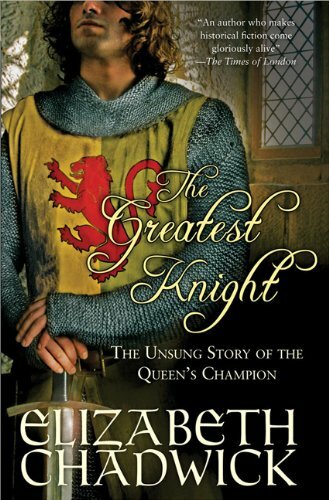 But “The Greatest Knight” by Elizabeth Chadwick only covers the story of William Marshal’s service to the first two kings, King Henry II and King Richard I. But his service and loyalty was also to King Henry II’s wife, Queen Eleanor. The story opens with William Marshal given as hostage to King Stephen when he was but a boy. William’s father, John Marshal, betrayed King Stephen. King Stephen threatened to kill the hostage, but John Marhsal still refused to give to the king’s demands. Fortunately, King Stephen could not kill the child. As the second son of John Marshal, William had no titles, inheritance, or income of his own. Younger sons were often given to the clergy or trained in the military arts. William was given to William de Tancarville, his mother’s cousin, for military training. Later, William served his mother’s brother, Patrick, Earl of Salisbury. And from there, William made a living by winning tournaments such as jousting. At some point in William’s life, his bravery earned him Queen Eleanor’s favor. Queen Eleanor appointed William to serve her young son, Henry. Between his service to Young Henry to his service to King Henry the II, and then to King Richard I, William Marshal was part of a royal rebellion, accused of inappropriate behavior with Young Henry’s wife, went on a crusade to Jerusalem, and married Isabel de Clare to became Earl of Pembroke. I thoroughly enjoyed the history. But there is just something about the story that couldn’t get me into the characters. It told the knight’s story and gave historically accurate descriptions of events, clothing, and everyday life. But it didn’t delve enough into the character of William Marshal. I felt like I was watching the story from the outside rather than being a part of it. Perhaps because it is historical fiction, it focused more on the historical part and didn’t presume to know how William Marshal felt about all the events around him. Nonetheless, the history of William Marshal is very interesting. Likewise, the story does a good job of bringing that history to life. If you do not know who William Marshal is, I highly suggest you read more about him. And if you think history is dry, you can start out by reading “The Greatest Knight” by Elizabeth Chadwick. Although her story is fiction, it is obvious that Elizabeth Chadwick has put a lot of research into it and has made the story as historically accurate as possible. The sequel to “The Greatest Knight” is “The Scarlet Lion” and will cover more of William Marshal’s service to King Richard I, King John, and regent to Henry III. I will definitely be purchasing this second book and reading about the rest of William Marshal’s extraordinary life. The Third Dragon (The Dukarian Legacy) opens with a description of a land devastated by generations of war where a prophecy of peace is the country’s only hope against the constant fighting between factions. One Tomis Dukar, the third son of King Haban Dukar and descendant of the ancient Dragon clan involved in the prophecy, is pitted against his own evil father who has a different idea of how the prophecy is to be fulfilled. His first task involves a struggle against his own blood for his survival. The future of Ungal seems to lie in the Dragon clan … but how the prophecy is interpreted could change or destroy the country. The resulting conflict leads Tomis to undertake a long journey at a young age during which he confronts different ideas and incarnations of evil, finds unusual friends with unique abilities to compliment his own powers, and finds help in a magical order that lends him power against the evil forces amassing against him. Poetic reflections on right, wrong, and struggle permeate a fine story of friendships and the hidden costs of warfare and even peace. In the end spirits, magic, and issues of a father’s love and dangerous ambitions come together in an unexpected manner to provide a satisfying conclusion to a fantasy adventure packed with action and twists of plot and characterization. The story won’t end here: anticipate additions to The Dukarian Legacy down the line, even as the dust barely settles on Tomis’ ultimate fate and legacy. “The Third Dragon; Book One of the Dukarian Legacy” by Dawn Ross is available at Amazon.com and will also be featured on Midwest Book Review in November 2011. While reading “The Half-Known World on Writing Fiction” by Robert Boswell, I came to the realization that I am not a real writer. While I think my story is good, it is just that – a story. It is not an artistic piece of work. A real writer is more interested in writing for the sake of writing while a story-teller is more interested in the story. The depth that my work lacks is due to my inadequacy on the intricacies of writing. The inadequacies of my story are apparent in the first chapter of “The Half-Known World“. The first chapter discusses how important it is to discover your character as you write. If you tell all about your character right off, you dampen the mystery. Your character is predictable and boring, and quite possibly perfectly fits into a stereotype. This same step can be obvious in the story itself. Leave some aspects of the story half-known. This way when the full story is discovered, your reader is fulfilled. No one enjoys reading a story with a predictable end. By keeping the reader guessing, you are creating interest. The second chapter of “The Half-Known World” explains how characters should react within a paradigm. Robert Boswell’s example is of a society in the 1930s. People behaved a certain way towards African Americans in that time. To write a story in that setting and ignore this fact would make the story difficult to believe. If a character is to act outside of the paradigm, then the story should show why? Notice I said ‘show’, not tell. Chapter three of “The Half-Known World” goes into the use of what the writer calls narrative spandrels. A spandrel is an architectural feature but Robert Boswell applies it to writing. In writing, a spandrel is an element in the story that is part of the story but more of an accidental coincidence rather than a feature of the story itself. For example, a spandrel could be an insignificant item described in the story that somehow keeps presenting itself in the story. It somehow indirectly becomes the key or the glue to the story itself. But spandrels shouldn’t be obvious. By the end of the story, it should be a surprise. I found chapter four of “The Half-Known World” of good use. It explains how if you’re telling a story from a narrator point of view, you need to be careful about ‘knowing it all’. Is the narrator a part of the story or just an observer? Either way, the reader should only know what the narrator knows. The reader should only be confined to what the narrator sees, hears, and feels. If such a narrator were to know how another character feels or why another character behaved the way they did, then it gives the story an unrealistic feeling. A narrator can certainly express his opinion, but it should be clear that it is such. Other topics covered by “The Half-Known World” include how the imbalances between male and female characters creates tension, how stories can be in danger of sounding too much like an urban legend, using writing techniques to give a setting an unearthly or mysterious feeling, using writing to express a political or controversial opinion, and finally the importance of writing a mystery so that your character comes to the same conclusions as the reader at the same time. Of all the topics covered in “The Half-Known World” by Robert Boswell, the ‘half-known’ was the most interesting and the one which I know I need to work on the most. Thinking about this issue, I realize that I have my main character almost fully known right at the beginning of the story. We already know he is the hero, we know his full character, so we almost know how the story is going to go. There is no conflict of character and therefore no conflict of story. The good guy is good and the bad guy is bad. Does this mean I am going to go back to the drawing board? Probably, but not right away. For now, my book will stay published as it is. But to strive for a better story, I will read more books like “The Half-Known World” and practice more at writing short stories. 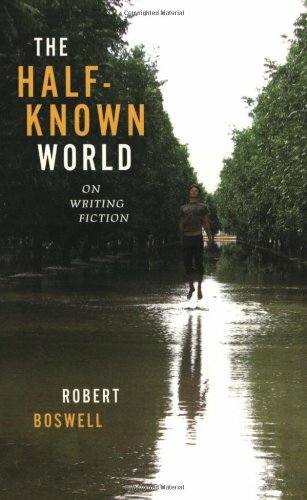 Before you write a story or book, start with reading “The Half-Known World on Writing Fiction” by Robert Boswell and hone your writing techniques. They key to becoming a good writer is to go beyond just telling a story – be a creative writer and intrigue your audience. I try hard to post at least once a week, but this week just hasn’t been very productive. I hope to see you next Saturday. I have been awfully busy lately so I haven’t had time to do much writing. Although I quit my full time job at the end of July this year, they called me back a couple weeks ago and asked if I would be willing to work for them again if they let me do it from home and for part time only. Since we are in need of additional money for IVF treatment, I said yes. We have also have a few car repairs to make before winter. And I have spent time cleaning house and promoting my new website, www.InformationWolves.com. I did manage to finally get my book, “The Third Dragon” published as an e-book on Amazon (see previous post). I should be working on getting that promoted but I think I will wait until the review is complete. Perhaps I should work on getting the website done in the meantime, but where will I find the time!? In the evenings, I have been reading George R. R. Martin’s latest book in the “A Song of Ice and Fire” Series, titled “A Dance with Dragons”. I just finished the book last week and although I enjoyed it immensely, I hate the fact that the sequel will not be available for some time. The story is complex and there is too much to remember in between books, so I took a lot of notes. I hate the fact that it seems like Jon died for I really don’t like it when the good guys lose. But it seems like he may live in some form, perhaps in his direwolf, Ghost. Will Jaime be back even though it seems like he is walking into a trap with Brienne? Cersei is getting her comeuppance and I hope it stays that way. And where the heck is Arya going with all this? She deserves retribution too but it seems like she is going the wrong way to get there. Now that I am done reading “A Dance with Dragons” I am reading a non-fiction book titled, “The Half-Known World” by Robert Boswell. I am only in the first chapter, but it is very helpful so far. He says that rather than knowing your characters, you want to start out with just the basic ‘stereotype’ and evolve from there. Don’t start out with your character already figured out as it may ruin the mystery. As I go further along in the book, I believe he will expand on the “half-known” truths in regards to the storyline itself. By only telling part of the story, you are keeping the reader engaged and wanting to read more. Makes sense, right? Since I have trouble generating mystery and intrigue in my book’s story and characters, I think this will help.